Who doesn’t want to take a journey of a lifetime? We all do. The good news is, my friend, you actually are on a journey of a lifetime. It’s the life you are living right now. This journey of a lifetime is your journey. No one else can take it for you. Caleb was a man who lived during Biblical times. His life was hard most of the time. He was born into slavery, fought battles for survival, lived in the desert for 40 years, and then fought more battles. But two things stick out about Caleb: the Bible says he had a different spirit and he followed the LORD wholeheartedly. What was different about Caleb? The Bible doesn’t exactly say, but my guess is that he was willing to trust God even when the road was difficult. Over and over Caleb witnessed God’s faithfulness which helped him trust God even when things got hard. While others looked to the circumstances in defeat, Caleb kept his gaze on God. He viewed his circumstances through God’s lens and it gave him the courage to move ahead. Caleb never let his circumstances define him because his focus remained on his great and mighty God. Caleb never wavered in following God. He followed Him through the parting of the Red Sea, followed Him into the wilderness, and followed Him into battles. What makes Caleb so special is how he followed God. In describing Caleb, the Bible tells us five times he followed the LORD wholeheartedly. Wholeheartedly is defined as: with complete commitment and sincerity. Caleb was all in! He knew His powerful and loving God and trusted Him especially in the most difficult times. 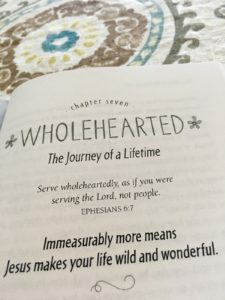 How do we, like Caleb, live wholeheartedly? Remember God’s faithfulness in both good and hard times. Live each day with confidence knowing God promises to travel with you on your journey. Look to each circumstance with full assurance of God’s power and love. Jesus never promised life would be without challenges. BUT he does promise this: He will go with you each and every day. This sounds like a journey worth taking!